What If Koenigsegg Made A Mad Off-Road Racer? This would be our car of choice for the apocalypse. It's no secret that Koenigsegg makes some of the most insanely powerful cars on the planet comfortably capable of breaking the 200 mph top speed barrier. Unlike other supercar manufacturers (we’re looking at you and ), the Swedish automaker , either. 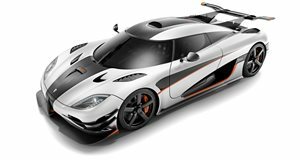 Christian Von Koenigsegg has even admitted that the manufacturer’s carbon chassis could technically be stretched into an SUV, but he simply doesn’t want to build one. You have to admire his reluctance to follow the herd. With 1,340 horsepower on tap, the Koenigsegg One:1 is designed to be tamed around a race track. But what if it was turned into a savage off-road racer to tackle rough terrain in the absence of a Koenigsegg SUV? Until someone is crazy enough to modify one, it’s extremely unlikely we’ll ever see a Koenigsegg off-roader. But thanks to a render by shared by , we no longer have to imagine what a such a creation could look like. Based on the already bonkers One:1 hypercar, Yasid has widened the wheel arches to house some monstrous all-terrain tires and wheels, as well as adding a ginormous rear wing, a rear diffuser, and a spare tire strapped to the roof. Essentially, this is what a Koenigsegg One:1 would look like on steroids. Apparently, the outlandish design was inspired by prerunner trucks that tear through off-road courses before a race. “I am always very interested in taking high end supercars and hypercars and tampering with them, to see what we can come up with,” the designer told . “This offends a lot of purists, but it’s somehow one of the things I personally like to do – the things that you would expect the least”. We think we’ve now found our car of choice for the apocalypse.